Besides a marriage proposal, your value in the job market is probably the most important product you’ll ever sell. … Your brand is what you’re known for and what you’re known for knowing. Use that to your advantage in making a career transition. #1: Be authentic. The best personal brands are genuine and honest both in person and online. It can be tricky to showcase your personality on the web (you might love puns, but those don’t go over well on a professional profile), but it’s possible with a bit of effort. What occasions these observations is an article in the Times, The Self-Promotion Backlash. The article is itself an observation on a new book, “Invisibles: The Power of Anonymous Work in an Age of Relentless Self-Promotion,” by David Zweig. Just got this for my Kindle, and after only a few pages of the intro its thesis is crystal clear: Vastly more economic output is generated by “invisible” non-self-promoters than by all the glad-handing, like-me-on-Facebooking, personal-branding addicts that seem to be surging ahead everywhere we look. One of the first examples Zweig talks about are fact-checkers, in his case at the CIA: pretty obviously essential, and pretty obviously invisible. In the high-tech industry, because we make the tools that allow all this personal branding in the first place, we’re expected to use them and to do so loudly and often. How bizarre that software engineers, one of the most introverted, invisible occupations you’re likely to find, get marked down because they are insufficiently “visible”. This is sales culture run amuck. Look, sales and sales-people – love ‘em, need ‘em, all that – but the cultural needs of engineering are vastly different from sales. Back in the day, the men and women I most respected hardly ever spoke. They were valued for their knowledge and their ability to show and tell novices, as I was, what to do to turn out good code. I’m afraid nostalgia is an inevitable product of age, and for that I apologize. But, if we did a 1 week ban on self-promotion, what would happen? Quality go up? Output go up? An impractical experiment of course … still, can’t help but wonder. I’ll leave you all with this, the most influential drum-line is all the history of rock and roll, Led Zeppelin’s When the Levee Breaks. It wasn’t created by drummer John Bonham, or Zeppelin lead guitarist and producer Jimmy Page, but by a recording engineer – and an invisible – named Andy Johns. Enjoy. I have a journey, sir, shortly to go. When Kent speaks this line at the end of King Lear, he has a truly final journey in mind, but the journey ahead of me now is just as all-encompassing as his. For 22 months I’ve been half a world away from my home. Now in less than 4 weeks I return there, and I‘m filled with a sense of unreality. You know, I can’t say for certain if my USA home even exists. Logically of course I know it does – daughter Alex lives there and Kim was there only a month ago. Yet, the feeling remains. Given enough physical and cultural distance, we become disconnected, floating. Having seen up close how big the world is, how strange to suppose I shall float back exactly to where I started. Writing this post and thinking about journeys, the picture above occurred to me. 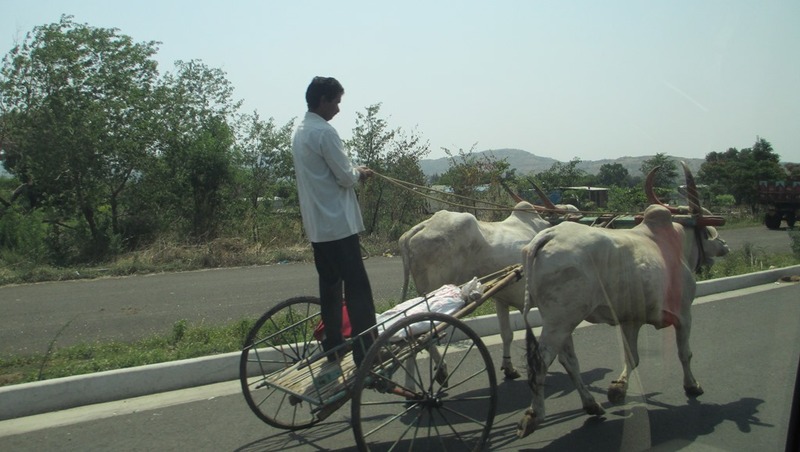 This bullock cart is a common kind here; it is used for carrying long things, like bamboo poles, which would jut out 2 or 3 meters off the back end. What struck me was the driver’s concentration: keeping his balance, watching the bullocks, heading back to a precise and (for him) important destination. A humble journey to be sure, but how many of us can say we go from one place to the next with such certainty? The loneliness of the expatriate is of an odd and complicated kind, for it is inseparable from the feeling of being free, of having escaped. 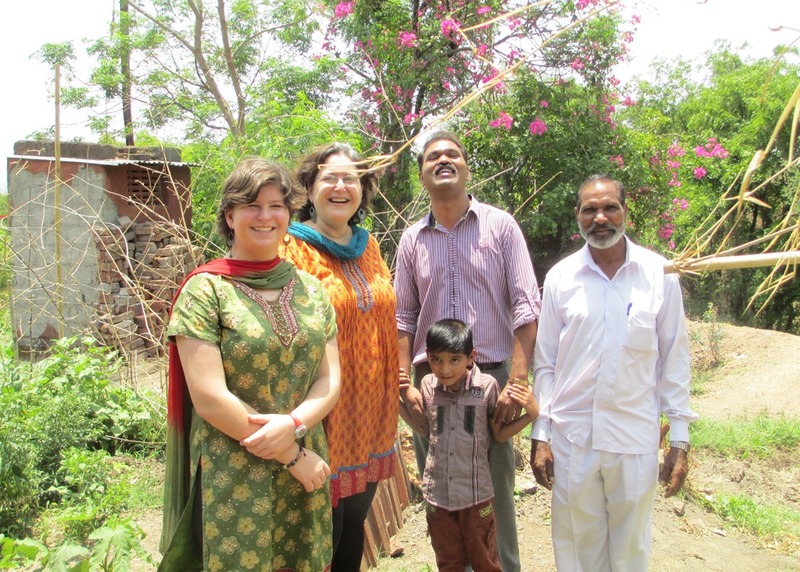 The family and I, just 2 weeks ago, did have a great experience of not feeling isolated when our driver Rupesh invited us to his family’s village home. About 100 kms south of Pune, we left on a bright Sunday morning and reached in a little over 2 hours. Here’s Morgan and Kim (wearing kameez, no less) with Rupesh, Rupesh’ Dad, and Rupesh little boy in front. This was just beside a backyard garden where I had just invoked much astonishment among the children by eating some chilies right off the plant. Soon after we had one of the greatest meals I have yet had in India. I’ve written before on Indian hospitality. Here, if you come into someone’s home you will be given the best of everything and the food, I guarantee, will be there in such quantity even the heartiest eater will be challenged. We had mutton curry, potato curry, dry-braised ribs and bones of mutton, two kinds of rotis, salad, rice and chutneys … but the star of the lunch was freshwater crab curry. The gravy was amazing. Rupesh told us his Mum would take the claw meat from the crabs – which were not big, the bodies were about 4 inches across – and lightly pound it till it was a flaky paste. The claw meat then goes into the gravy and thickens it and flavors it. The gravy was more of a soup – the richest, most intense crab flavor I have ever had. Now, I have had Lobster Bisque at some good restaurants, “five star” as they say here in India. This crab gravy put any such soup I have ever had to cringing shame. Here’s the village school, with hills in the distance; some chilies drying in the sun; and, an old bullock cart, the ancient uncle of the one we saw on the road. The village is a modest place and the pace there now is slow; farmers await the coming of the monsoon before starting the next planting. It is a time for maintaining tools, cleaning the sheds and, mostly, sitting in the shade and talking. A wonderful afternoon. Children played outside with their friends, and many relatives were visiting. They were there to see the famous Salazars (other than aid workers the first Westerners to ever come to this place) but we were not on display, everything was welcoming and easy-going. The ladies worked furiously in the kitchen and invited Kim in for some impromptu roti-making lessons. One young cousin of Rupesh asked us many questions about USA. He told us science and history were his favorite subjects, and that he hoped to go to an American university. May it be so. 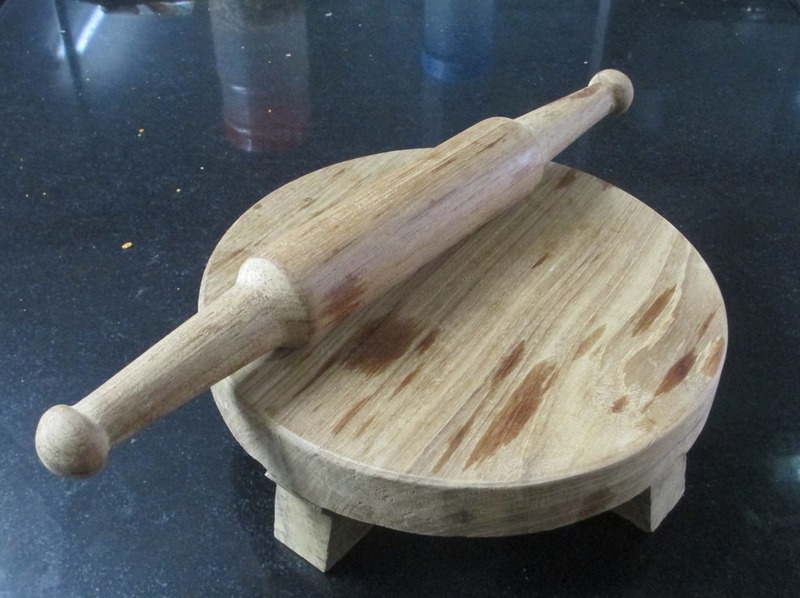 This rolling pin and board – a belan and chakla – were made by hand, by Rupesh’ Dad. The wood is smooth and heavy; a hundred years from now I expect our descendants will still be using them. I know that, in time, the village will become as unreal to me as my own home now seems to be. But for the moment the image of it is very clear: A good place, where there are many challenges and obstacles, but also achievements and celebrations. We should all have so much in our own homes. And so the start of the next journey draws near. In the weeks I have remaining I hope to make some posts on the good, and the bad, I have seen here. Take care till then. Sorry for no blogging in a while, have had a lot of customer trips/meetings at work, and the activities for the return back westward for me and family have begun. Less than 2 months till we are all back home, where doubtless we’ll dream of India the way we dream of Massachusetts now. Anyway, on to this longish posting. Lest we forget – lest we forget! I’m afraid today neither East nor West has a great view of Kipling. Here in India he is typically dismissed as a racist, though perhaps a congenial one. And in the West, he is alternately lauded then excoriated as a dead white guy. I knew some of that when I was in the bookseller’s and saw Kipling Sahib, by Charles Allen. But frankly my motivation to get the book was boredom – there’s not a lot to do out here and all we Salazars pass a lot of time by reading. 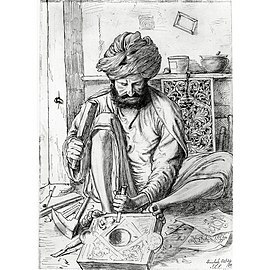 Kipling Sahib was a welcome surprise. The author, Charles Allen, comes of a long-time Anglo-Indian family and his grandfather, George Allen, was founder of the newspaper The Pioneer. It was George Allen who employed Kipling as a journalist and later as associate editor, and so connected with the Kipling family, as ex-patriates were wont to do in those days, in a way that persisted over generations. The life of Kipling that Allen relates has a Downton Abbey-like quality to it. It was the Victorian era after all, and parents were comfortable with sending children thousands of miles away for schooling while they themselves strove for advancement in the far flung colonies of the Empire. This time in England for Rudyard, age 5 to 12, and for his younger sister Trix, was to mark him forever. It was in England while still only a boy he discovered his avocation for writing. But it was also an episode of loneliness and abandonment that was to inform all of his work and life to come as well. Later when Rudyard became an adult and returns to India he has his share of excitement and disappointment in the highly insular and stratified society of British India, especially at its favored summer location, the mountain city of Simla. It is in Simla that the eccentricities of the British character conjoin with the diversity of India to create some rather amusing instances, like the 100,000 item collection of birds, eggs, and other natural artifacts that Allen Octavian Hume intended as source materials for an epic work entitled The Game Birds of India, Burma and Ceylon, but was sold off in the bazaar for kindling by a servant during one of Hume’s absences. This same Hume later became a follower of “theosophist” Madame Blavatsky, who claimed powers as a medium; J.L. Kipling dismissed her as ‘’”one of the most interesting and unscrupulous imposters I have ever met.” Later when Blavatsky’s deceptions were exposed and Hume withdrew his support, Kipling’s employer The Pioneer suffered greatly, as the paper had endorsed her. These, together with numerous romantic intrigues, were the doings of Simla observed by Rudyard aged 17 or 18. Interestingly, Allen Octavian Hume went on to become a sponsor and founder of the Indian National Congress, the party that would fight for and ultimately achieve Indian independence. “Have you ever tried that trick?” I asked. “Residents” are British officers or officials, assigned to help keep order in the independent states. And ‘Backwoodsman’ was an obvious reference to The Pioneer. But some say, and among these be the Gurkhas who watched on the hillside, that that battle was won by Jakin and Lew, whose little bodies were borne up just in time to fit two gaps at the head of the big ditch-grave for the dead under the heights of Jagai. I can barely imagine how such realism was received in 1895. Even today this poem quite rightly resonates, as it was taken as inspiration by British troopers in Afghanistan, there again after a 60 years of absence. So, should you read Kipling Sahib? If you are the reading kind, or a Kipling completist, or perhaps in need of distraction as I was, then certainly you should. Otherwise, I have to say no; the book has too much biographer’s detail. Instead, if you have not done, you should read Kim. I have long known of this book – in it Kipling invented the term “the Great Game”, after all – but never read it. I assumed it was adventuresome, like The Man Who Would Be King, so felt no great reason to read it. But after reading Kipling Sahib, and finding many free editions of Kim on Kindle, I thought, why not? ‘Long and long ago, when Devadatta was King of Benares – let all listen to the Tataka! – an elephant was captured for a time by the king’s hunters and ere he broke free, beringed with a grievous leg iron. This he strove to remove with hate and frenzy in his heart, and hurrying up and down the forests, besought his brother-elephants to wrench it asunder. One by one, with their strong trunks, they tried and failed. At the last they gave it as their opinion that the ring was not to be broken by any bestial power. And in a thicket, new-born, wet with moisture of birth, lay a day-old calf of the herd whose mother had died. The fettered elephant, forgetting his own agony, said: “If I do not help this suckling it will perish under our feet.” So he stood above the young thing, making his legs buttresses against the uneasily moving herd; and he begged milk of a virtuous cow, and the calf throve, and the ringed elephant was the calf ’s guide and defence. Now the days of an elephant – let all listen to the Tataka!– are thirty-five years to his full strength, and through thirty-five Rains the ringed elephant befriended the younger, and all the while the fetter ate into the flesh.